Here in Miller Valley you will experience an indoor/outdoor guided walking tour of over 160 years of brewing history. Experience everything from Fredrick Miller’s arrival in Milwaukee to the high-speed production lines used today. 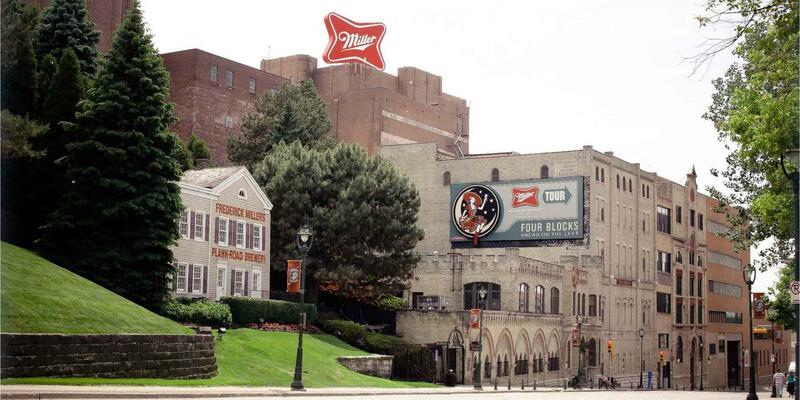 Your tour seamlessly blends the rich history of Miller Brewing Co. with the modern technology of today’s brewing process. Our tours begin with a beer because… why not? We will immerse your senses as we take you back in time to our famous underground caves and historic, Bavarian-Style Miller Inn. Don’t worry, you will rejoin us in the 21st Century as we move on to our modern operations including our Brew House, Packaging and Distribution Centers. Ice-cold refreshing samples of our finest brews will be served at various stops along the tour (and after!) for those 21 and older. Water and soft drinks are available for guests under 21 or upon request. Please note: This tour does include considerable walking including 46 mandatory / 56 optional stairs. Strollers are not permitted along the tour route nor are we able to store them in the Visitor Center lobby. We apologize for the inconvenience. No weapons of any kind are permitted on the Miller Brewing Company campus. Oversized bags will be subject to search. At this time we accept walk-in ticket purchases and pre-paid ticket reservations via phone at 414-931-BEER (dial 0 for customer service.) Tour reservations will be available for pre-booking up to one month in advance. No refunds available within 48 hours of your tour time if your plans change. Calls are accepted during business hours Monday-Saturday 10:00 a.m. – 5:00 p.m. CST. Online Reservation System coming soon. Tours typically run every 30 minutes between 10:00 a.m. and 3:30 p.m. during winter hours of operation. See below for a list of seasonal extended hours. Tour times can vary and we encourage you to visit our Facebook page or call 414-931-BEER for an updated daily tour schedule. Tours may run more frequently or as late as 5:00 pm Thursday – Saturday during peak summer season. Note: We do NOT run tours on Sundays, but do offer beer garden hospitality hours and with full retail operations. Miller Brewing Company welcomes guests with disabilities who wish to take its brewery tours. Given the nature, size, and shape of our facilities, only service animals trained or in training to do work or perform tasks for the benefit of an individual with a disability are permitted on tours. We cannot allow other dogs, pets, or animals, including those whose sole function is to provide comfort, emotional support, companionship, or therapy. We are able to accommodate many special needs tours. We ask that you contact us at 414-931-3552 at least 24 hours in advance so we may make arrangements for your visit. Tour reservations are recommended for groups of 15 or more Monday-Friday. Group tours will receive a 15% discount for each attendee 21 and older if booked together. You must arrive at least 15 minutes prior to your tour time or we will release your reservation for public tour walk-ins. For your convenience, bus parking is available in our Visitor Center parking lot. Please contact us at 414-931-3552 with your group tour reservation requests and payment. No cancellations within 48 hours of your tour. Private Tour Reservations are available upon request. Please contact us at 414-931-3552 for availability and pricing.